I will have you pay back what you "owe" me now. Don't bother with that. Just go back to the hospital. so do your very best not to be killed! Geez, looks like I'm still late, even after I've hurried so much. Even though I was just looking into things a little, everyone went off without me. Just who would gain anything from that...? How would you react if I said "yes, I am"? if you answer a question with another question? Idiot. My, tests in the outside world must be pretty severe. ...So, you mean you're from this world? That just got you a big fat zero. Man, this really is severe. working for the "Senri Shrine". No, you've got it messed up. Sounds like a pretty unpleasant place. It seems that you have no intention of being serious either. I mean, weren't you the one who came to me asking questions? So anyway! Why are you imitating me like this!? Is there something you're trying to accomplish? Why would I imitate someone if I didn't have something to accomplish? ...So anyway! Looks like you made it here first. But there isn't actually any prize for you, I'm afraid. You said you were going to punish me, didn't you? So, show me how you're going to punish me. What'll I get in return again? Probably just a measly 100 yen. BGM: Eternal Dance Engine ~ Shall We Dance!! Oh my~, I give up~. You did really well punishing me, I'm really glad! You didn't even fight with your true power? What a troublesome person. Is that really what you would call troublesome? It makes you seem pretty crazy. ...However, if I had used my true power, I would have killed you, you know? why you called all of us into this world? It's because I have a task for you. while I'm out on trips and stuff. And what job is that? I already told you, I work at the shrine. Ahh... So you're saying I gotta be a priest? Yes! The righteous priest who protects the country beyond here! Is that so? You'll agree to do it? Don't force the conversation along on your own. I'll tell you more about it, after I welcome the intruder. They're an acquaintance of yours, aren't they? I guess I knew they would be here sooner or later. I'll hide over there and watch from above. Maybe I'll even have a drink or two while I watch. ↑ 1.0 1.1 1.2 Tsurubami is speaking English in the original text of these areas, meaning "Yes, that's right!" (actually "Yes, okay! "), "Who are you?" and "One coin." respectively. The English translation is in Spanish. ↑ Mugenri (无現里) and Senri (闡裡) originally had furigana next to them to indicate the pronunciation, but were removed in v1.10a since their pronunciations are now obvious. ↑ Original pun: mugen (夢幻, fantasy) and senri (戦利, war spoils). ↑ Original pun: mugen (無限, infinite) and senri (千里, thousand miles), with Tsubakura questioning if there could even be a shrine that big. 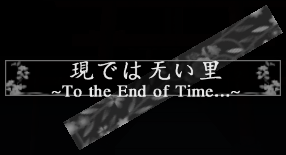 ↑ Likely a reference to a quote by Flandre Scarlet from Embodiment of Scarlet Devil . ↑ Wordplay on mendou (面倒, troublesome) and mentāru (メンタール, mentality). ↑ Same as Tsurubami speaking English. The original English is "No comment."